Not all 4WD vehicles are diesel. Debates run wild as to whether a diesel 4WD is better than a petrol equivalent. Having driven both, I’d say that the diesel versions are probably better if you’re going to be doing a whole heap of off-road work. If you are occasionally going bush, while content with running in and out to work most of the time, then a petrol 4WD is the smoother option that has plenty of top end power for road work and effortless cruising. 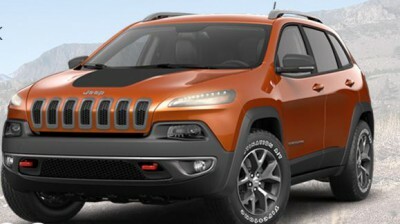 Jeep has an exceptionally nice Cherokee Petrol model, with loads of power, classy looks and plenty of room and luxury. This is a vehicle that loves to cruise the open roads and then impress with its phenomenal off-road ability. The Jeep Cherokee Petrol is like stepping into business class after travelling in a tight fitting economy class seat. The expansive dash swings across the breadth of the vehicle in a panoramic type vista. The switchgear looks and feels expensive, while the seat and interior upholstery and trim are nicely woven together to provide a very sumptuous environment to travel in. Jeep Cherokee Petrol models include the Sport (front wheel drive only) Longitude (all-wheel drive), Limited (all-wheel drive)and Trailhawk (4WD with low range). The top of the range Cherokee Petrol versions (i.e. the Limited and Trailhawk) have great satellite navigation, communications and audio systems, while a number of auxiliary outputs for extra electrical equipment can be plugged in like iPods, tablets and laptops. Base models more than live up to expectations for smooth refined off- and on-road transport, and the pair of petrol engines on offer are very flexible and grunty throughout the entire working range. In the Sport model, the 2.4-L inline-four engine is rated at 130 kW and pumping out 229 Nm of torque. The Longitude, the Limited and the Trailhawk are fitted with a 3.2-litre V6 with 200 kW and 316 Nm. With all this oomph handy, the new Jeep Cherokee Petrol range is never caught out of breath and can cruise effortlessly at high speeds. Just watch out for the flashing lights! One of the noticeable characteristics of the new Jeep Cherokee is that it is very well planted on the road, and handles very confidently on all road surfaces – not to mention off-road terrain. Cruise control is a welcome feature; the way the Cherokee petrol quietly lopes along can be deceptively quick at times. If you happen to be in the rear seats, the Jeep Cherokee Petrol has plenty of space for long legs to stretch out, and the view is commanding – even from the back. Exterior styling certainly has you standing out from the crowd as the large Cherokee has strong, elegant lines that are muscular and well proportioned. I think it has better looks than the Cayenne, Touareg and Q7. Nothing from Asia looks quite as good, except for the smaller Santa Fe. Safety is very good for all new Jeep Cherokee models. An array of passive and active safety equipment ensures you can settle into the drive knowing that this is one of the best vehicles to be in should an accident occur. I guess the best thing is to get yourself down and check one of these great vehicles out for yourself. Don’t forget that at Private Fleet, it’s our pleasure to get you the best deal on wheels. For any more information on the 2014 Jeep Cherokee Petrol, or for that matter any other new car, contact one of our friendly consultants on 1300 303 181. If you’d like some fleet discount pricing (yes even for private buyers! ), we can submit vehicle quotes requests out to our national network of Jeep dealers and come back with pricing within 24 hours. Private Fleet – car buying made easy!